You’ll often see me talk about games that will sell me on a single screenshot here. One of the best ways to get me interested in your game is to show me some hand drawn frames as a part of actual gameplay. 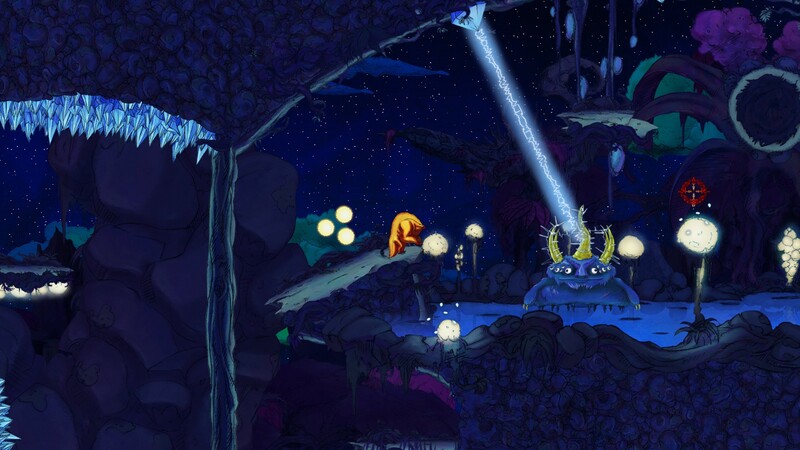 Aaru’s Awakening, an puzzle-y platformer with a beefy birdy as its protagonist, is easily one of the most hand made games I’ve ever seen. 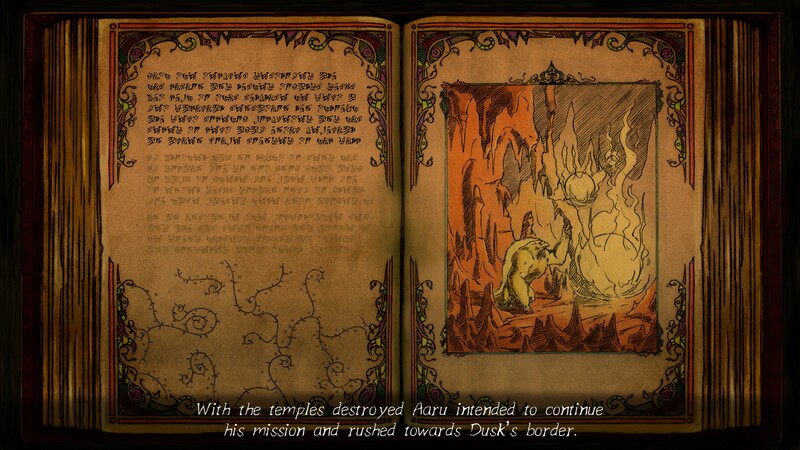 As I said in the intro, Aaru’s Awakening immediately and thoroughly blew me away with the handmade detail of its visuals. Every last bit of this game has the look of traditional cel animation. And while the frame rate of the individual animations isn’t what I’d call buttery, but on the whole they were not stingy. Take, for instance, Aaru’s running animations. In order to activate the powers that really define this game, you’ll be moving your mouse pointer or control stick quite a bit. In a frame by frame game, you’d usually just have a run left and run right animation and ignore the pointer position. In a game with individual elements split onto layers you could probably expect to see a head tilting to track the pointer. In this game, you’ve got stubtly different runs depending on the pointer location. He could gallop forward or sidestep along, keeping his body angled realistically to keep tabs on that wily pointer of yours. 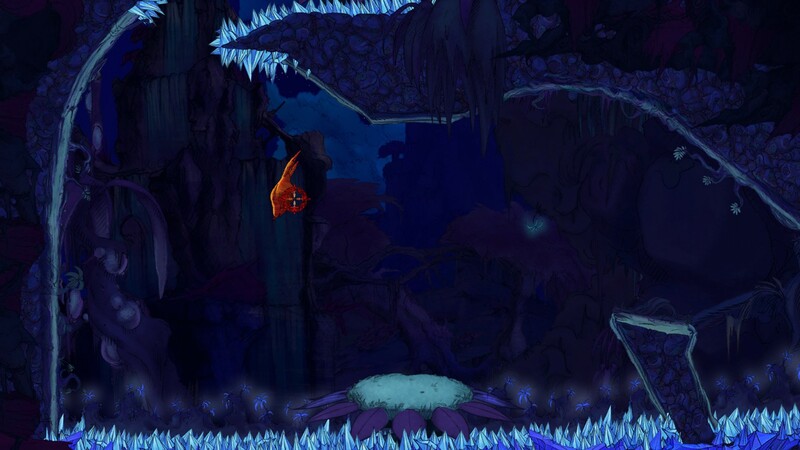 The environment and enemies are heavily animated as well. In one notable instance a ball of goo chases you down a hill, and just when you think you’re safe from it, it oozes through the hole you slipped through. 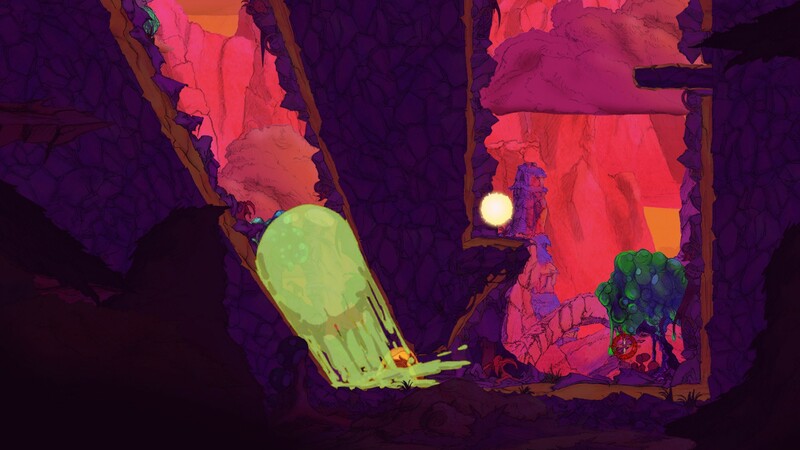 The oozing isn’t just a little calculated slosh, it’s a sticky, gooey, frame by frame splurt that I was happy to see a half dozen times as I failed to escape it each time. Goo. As beautiful as it is deadly. As a final thing that is equal parts strength and weakness, there’s the variety of the visuals. You play through various stages of a day (Day, Dusk, Night, etc). And each level has its own theme. But the utter inventiveness of the visuals gave me a bit of tonal whiplash at times. On one hand you’ve got tentacle-y hell beasts from beyond your nightmares. On the other you’ve got google-eyed muppet monsters that wouldn’t look out of place on Yo-Gabba-Gabba. I like the variety, but when you’re doing battle with the physical manifestation of the abstract concept of night on at one moment and floating through the air in a bubble the next, you might be a bit thrown. Whoa. The googly eye ratio just went WAY up. 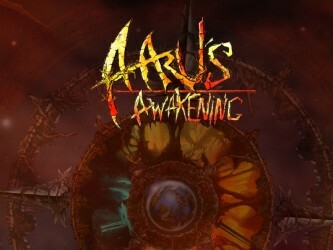 Aaru’s Awakening is what I’d call a “Rub your head and pat your stomach” type of game. For the basic gameplay, you’ve got standard running and jumping, which I did via the keyboard. You’ve also got a “charge” which can be used once per jump. This does the job of the typical double jump, allowing you to extend and more importantly redirect your leap. It also allows you to break through specially highlighted walls, meaning you can’t use it all willy nilly, since sometimes you’ll need to do some demolition in midair or you’ll be landing in a hazard. The key to the game though, is your ability to teleport. This is handled in a fairly novel way. Rather than just teleporting to where the mouse pointer is, or creating portals with the mouse pointer, you basically lob an arrival target, and when you are ready, appear wherever it is. This has some interesting strengths and weaknesses. On one hand, you can use it to do bank shots or arcs to avoid having to simply travel in a straight line. You can even throw it with decreased power in order to achive this, although this is done via a “hold down the launch button to DECREASE power” method which is… strange. I understand that nine times out of ten you want to blast it full force, but the “hold to charge” is so baked into my brain that “hold to weaken” was hard to adjust to. Naturally the game uses these abilities to the utmost, eventually introducing walls that will destroy your teleport target, walls that the target will stick to, and projectiles that will destroy the target. It is also worth pointing out that teleportation is as much an offensive tool as a defensive one. To kill most beasts that CAN be killed, you have to telefrag them. Now, the thing that really made this game tough for me is that for the most challenging puzzles, such as the boss fights, you have to perpetually keep track of the following. Where is Aaru? If he gets hit, you’re starting back at the check point. How fast is Aaru going? This determines the behavior of the target when you throw it and also where you’ll end up, naturally. Where is the target and where is it going? You’ll need to time it and aim it just right. Have you used your “charge” yet? You might need it to stay airborne or to smash something. Where are the hazards? Is that a breakaway platform, what’s my best target? Will that destroy my portal ball? Same game as the one with the googly eye muppet. THERE ARE A THOUSAND THINGS TO KEEP TRACK OF! I felt like a plate spinner by the end. For me it got a little frustrating, but I think most people who have reflexes a bit faster than molasses will probably find it a delightful challenge. The game is fairly short, but for completionists there are oodles of replay value in that you’ll need to finish levels below a certain par time in order to score bronze, silver, or gold medals, and those times are TIGHT. The music is thematically appropriate, but I wasn’t overly impressed by the narration. The story, which is told via voice over between major levels and illustrated with gorgeous stills, is pretty fascinating. You’re playing as the avatar of Dawn, who has deployed you against Night, who has got vile plans for the world… according to Dawn, anyway. As the loyal servant of Dawn, you naturally will do anything it tells you… but increasingly the orders are appearing unnecessary, or even malicious. You’re forced to cut a bloody swath through the lands of Day and Dusk just to get to night, and there’s some question of how such a thing can be justified. What begins as a story of a heroic servant doing what must be done quickly evolves into a story of doubt and a once mindless best developing and grappling with new emotions. Quite deep, really. 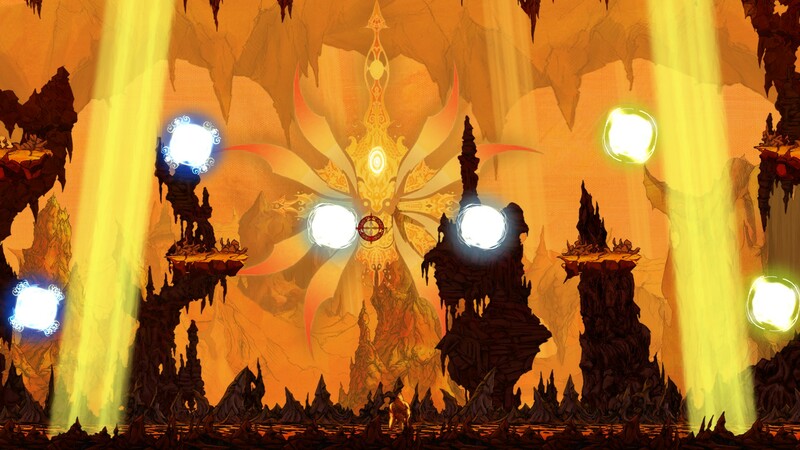 Aaru’s Awakening is aesthetically beautiful, artistically compelling, deeply challenging, and based upon novel and inventive mechanics. Honestly, if you were to make a check list of the things you would demand of a top quality indie title, this one would pretty much codify each individual checkbox. As long as you’re okay with what might be a bit of an over the top visual variety and a few narrations that slur and stumble ever so slightly, you’ll be in for a great game. 9.0 / 10: A great mechanic, beautiful visuals, and a deeper than average story make Aaru’s Awakening an almost quintessential indie game.